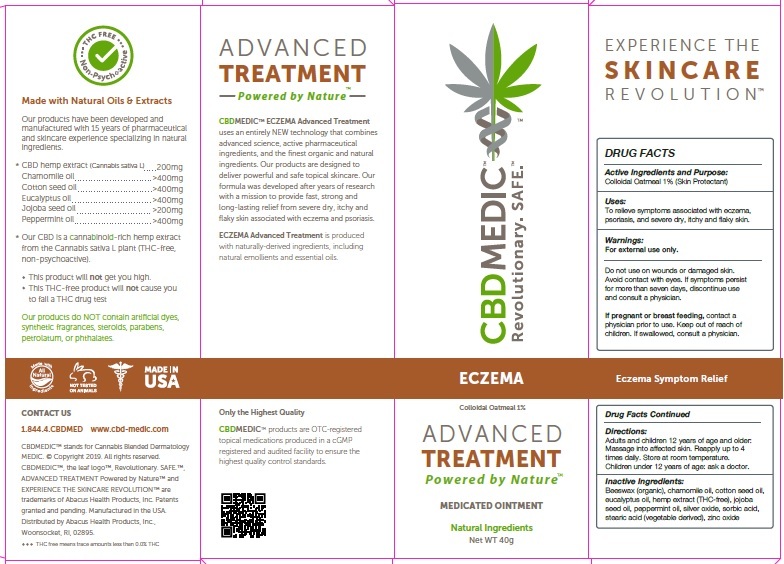 Proprietary Name: Cbdmedic Eczema What is the Proprietary Name? Non-Proprietary Name: Colloidal Oatmeal What is the Non-Proprietary Name? Cbdmedic Eczema with NDC 24909-730 is a a human over the counter drug product labeled by Aidance Skincare & Topical Solutions, Llc. The generic name of Cbdmedic Eczema is colloidal oatmeal. The product's dosage form is ointment and is administered via topical form. To relieve symptoms associated with eczema, psoriasis, and severe dry, itchy and flaky skin. For external use only. Do not use on wounds or damaged skin. Avoid contact with eyes. If symptoms persist for more than seven days, discontinue use and consult a physician. Adults and children 12 years of age and older: Massage into affected skin. Reapply up to 4 times daily. Store at room temperature.Children under 12 years of age: ask a doctor. Beeswax (organic), chamomile oil, cotton seed oil, eucalyptus oil, hemp extract (THC-free), jojoba seed oil, peppermint oil, silver oxide, sorbic acid, stearic acid (vegetable derived), zinc oxide.